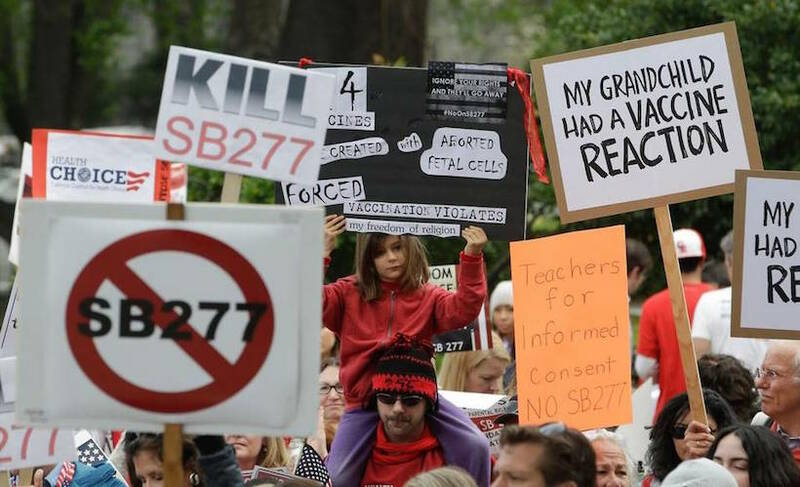 In June this year Bill SB277 was controversially signed into Californian State law, which legislates that all school-age children in California are subjected to mandatory vaccinations according to the State’s vaccine schedule. Its passing into law was seen as a major loss in the fight for freedom of choice and parental rights by both human rights groups and the anti-vaccination lobby. Going a step further, legislators in Australia have recently passed laws that require both children and young adults to be vaccinated in order to receive family tax benefits payments. The newly passed “No Jab, No Pay” laws (see: Social Services Legislation Amendment) will commence as of January 2016 — at the same time that mandatory vaccination laws also in California take effect. The Social Services Legislation Amendment was originally proposed to cease financial benefits to parents of children up to and including age 7 of who weren’t complying with the immunization schedule set out and monitored by the Australian Government. Now however, the Government has quietly altered the age definition of children from “under 7 and born on or after 1 January 1996”to “under 20” — with barely a peep from the mainstream media. This amendment is the first step in making vaccines compulsory for all Australian adults. Under Australian law you are legally classified as an adult as of age 18. Therefore, the Australian Government has quietly mandated that adults under 20 who receive family tax benefits and who are not vaccinated according to the schedule will cease to receive benefits, modifying the terms of mandatory vaccination without public scrutiny. Accordingly, the Childhood Immunization Register will be renamed the Australian Immunisation Register, and will record adherence to the government vaccination schedule — a schedule that may also be modified, with any number or type of vaccines added to the schedule at any time. Regardless of your belief in the value of vaccinations, the principle behind this kind of policy making should raise serious alarm bells. While voluntary vaccine uptake is declining, how can policies of mandatory enforcement be justified, removing our legal right to choose our own medical treatment and the treatment of our families? And where does it end? If government can presume to hold rights over our very bodies, and we accept it – either actively or passively – what recourse will we have when government uses the same rationale to enforce a policy with which we do not agree — for example, mandatory RFID chips? Call it what you want, but fascism is fascism, irrespective of whether you agree with the outcome. The fact that the emotion of the vaccine debate has clouded so many people’s view of what is acceptable and lawful action of a supposedly democratic government is extremely disconcerting. As the mandatory vaccination precedent moves us yet another step closer to losing all legal rights to free medical choice, what can we do? Let’s use California as an example. The key to enforcing your lawful (as opposed to “legal”) right to choice is in the wording of the law. In fact, the wording of Bill SB277 and the definitions contained in the STATE OF CALIFORNIA Statutes render this legislation useless. And this fact is exactly what parents need to understand. The original meaning of “person” is taken from the Old French word, ‘persone’, from the Latin persona, meaning “actor’s mask, character in a play”. This is exactly what our legal identity provides — a mask through which we interact with rigged legal and financial systems. The laws enacted by government apply to that legal entity, not to living humans, and by assuming that persona or mask, we consent to being bound by the “rights” (which are actually privileges) and responsibilities imposed upon that legal entity. There are two persons identified in law: these are “natural-person” and “artificial-person”. An artificial-person is a legal entity that is not a human being. A natural-person is a “legal entity for the human-being” not of the human being. (This is an important difference. A door FOR a house is a door; it cannot also BE a house.) A “natural-person” is something constructed by human beings, and so must be some ‘thing’ other than human — something created FOR humans to use. As the “natural-person” does not live, it is dependent for all its actions upon the consent of a living, breathing human being to represent it — and give it “life”. For example, when a police officer asks for official ID or a judge asks you, “Are you Andy Whiteley?”, they are asking you to agree to a contract that provides a legal joinder between the living human and the legal entity (eg. ANDY WHITELEY) that bears your name. Without your agreement to play along, to represent that LEGAL ENTITY within the system, government knows it cannot exercise control over your living being. And why should it? Government itself is the creation of living beings, so in the natural hierarchy, human trumps institution every day of the week. “[I] have come to the conclusion that the current legal and political system in use in Australia and its States and Territories has no basis in law.” ~ Sir Harry Gibbs, former Chief Justice of the Australian High Court. If a ‘Person’ is a Legal Entity, What is Your Identity? If We Are Free Sovereign Beings, Why Do We Ask For Permission? The End of Medical Freedom? While our freedom to choose is being systematically removed by law, with the support of many vaccination advocates, this imposition is not supported by a medical consensus on the safety and efficacy of vaccinations. While scientific dissent is secondary to the point of this discussion – the mandating of vaccinations – understanding the true performance of vaccines provides important context as to the political motivations behind this mandate. A recent measles outbreak affected a population that is 99% vaccinated against the disease, far above the theoretical “herd immunity” threshold. HPV cancer rates are rising despite increased vaccination rates. Malignant Mumps continues to recur in MMR-vaccinated children. HIV vaccine was shown to increase the risk of HIV infection. Studies show that infant Hepatits B vaccines do not prevent infection. Live flu vaccines have been shown in studies to increase infectious bacteria counts. The Whooping Cough vaccine has been linked to the emergence of a new strain of Pertussis while CDC data reveals the majority of people affected by pertussis are fully vaccinated. Studies have linked vaccine-induced immune overload and heavy metal toxicity to a variety of diseases, including autism and ADHD. Authorities found that the Swine Flu vaccine causes chronic nervous system disorders. The widespread adoption of chickenpox vaccine has resulted in a decline in chickenpox cases but an increase in the incidents of herpes zoster (shingles), a more serious expression of the chickenpox virus. An Institute of Medicine report found that MMR vaccines can cause seizures, anaphylaxis and other health problems. Increasing childhood vaccinations have been linked to a increased infant mortality rate. Data from the Council of Foreign Relations, which has been tracking outbreaks of vaccine-preventable disease since 2008, found that countries with the lowest mandatory vaccination rates also have the lowest infection rates. Meanwhile evidence continues to emerge that a phenomenon knows as ‘viral shedding’ (the passing on of the viruses contained in vaccines) may mean that the vaccinated are actually putting the unvaccinated at risk, not the other way around. While exposure to viruses and bacteria is necessary for the development of a strong immune system, particularly in early life, emerging science suggests that viruses and bacteria (the target of vaccines) may provide DNA with elements important to its function, and that vaccination actually turns immune system on itself, casting further doubt on the compatibility of vaccination — an unnatural intervention — with the natural beneficial relationship our bodies share with the microbial universe. Despite this, the myth of “scientific consensus” on the benefits of vaccination and in particular the “herd immunity theory” have been perpetuated by politicians, media and the pro-vaccination lobby, who continue to claim that the unvaccinated can somehow infect those who are already protected by vaccines. Modern vaccinations also include adjuvants such as mercury, aluminum and formaldehyde which, while known to be toxic to the human body, have never been studied from a pharmacokinetic viewpoint to determine the rates of bodily absorption, distribution, metabolism, excretion and side-effects. Thimerosal is a mercury-containing compound that is a known human carcinogen, mutagen, and immune- and reproductive-system disruptor with no established toxicologically safe level of exposure for humans. Further, thimerosal-derived ethylmercury has also been proven to be a mitochondrial (DNA) toxin in human brain cells, while aluminum is known to accumulate in the brain, and is linked to increased rates of Alzheimer’s and other neurodegenerative diseases. Mandatory vaccination laws therefore have the potential to create a society plagued by diagnoses of Alzheimer’s and other neurological conditions, as vaccination schedules are increasingly enforced. While such a surge would no doubt be profitable to cure-averse pharmaceutical companies, it is not in the public interest. Clear conflicts-of-interest are apparent in vaccination approval/regulation processes, the corporations that manufacture vaccines are protected by law from being sued for damages when their product causes harm (the disastrous Gardasil vaccine is a prime example), and private health insurance companies will not insure you and your family against the potential of vaccine damage. This means that, with so many questions still to be answered about the safety and efficacy of vaccines, and so few (if any) safe-guards in place to protect consumers, vaccination is an uninsurable risk — and now, in many jurisdictions, it is a mandatory one. Mandatory enforcement of any medical procedure is not only unlawful but unethical. Regardless of your beliefs on the value of vaccinations, this encroachment on our legal rights — in this case, to choose our own medical treatment — is an affront to our democracy. Pro-vaccine parents: please remember, pro-vaccine means “believes vaccines are the right choice for my family”. It does not mean “thinks people shouldn’t have a choice” — that’s pro-fascism. Please also remember that, despite the black and white representation by mainstream media, “anti-vaxxers” include not only those who oppose vaccination overall but also those who oppose mandatory vaccination, and those who believe that, while vaccination has its merits in disease control, the intensity of the steadily increasing vaccination government schedule and/or the composition of modern vaccines are harmful to health and immunity. Parents on the fence: ask more questions, do your research, and don’t believe everything you hear. Anti-Corruption Society and Parents Against Mandatory Vaccines: You can download a number of resources and templates that will help you issue legal notices to your child’s school, your college, your employer, your government and other institutions that may seek to enforce mandatory vaccinations. NVIC Advocacy Portal: Become an effective vaccine choice advocate with this free online interactive tool, which provides information about proposed legislation relating to vaccine policy and your ability to makeinformed vaccine choices. The NVIC were instrumental in successfully defeating the removal of personal and religious objection clauses from legislation in many US states. Ask 8 Vaccine Information Kiosk: Download brochures on vaccines and how to recognize vaccine reaction symptoms, as well as posters and web badges, to help you educate your family and friends when you advocate for vaccine freedom of choice. Vaxtruth.org: a leading online resource for information about vaccination that is free of political and corporate interest. Nurses Against Mandatory Vaccines: a resource for nurses and healthcare workers who do not support mandatory vaccination. www.change.org/The Transparency Challenge: Australian Government and Decision Makers. Please be aware: This is by no means a simple situation and there are no simple solutions. Mandatory vaccination legislation seeks not only to take away your freedom to choose but targets the most vulnerable to help enforce it; those who most need the support of their community (via government benefits) to make ends meet. In the fight for medical freedom, there are likely to be losses. Realistically, standing up to government over your right not to be vaccinated while receiving payments from the same government you’re confronting is a far more complex matter than challenging your children’s right to attend school, for example. If you rely on government benefits and choose to refuse, you should prepare for the potential that government may terminate that support, or refuse your child entry to the school system. So please, consider your personal circumstances, including the non-government support you have available to you and your ability/willingness to home-school. And then ask yourself: Am I willing to trade my medical freedom for my benefits? Or my child’s seat in a school? This is a tough question, but it is the decision mandatory vaccination laws are forcing you to make here — and only you can make them. The key is to get empowered and get involved. Question and confront the imposition of mandatory medical anything. Communicate and network with each other, both locally and through the networks linked above. Connect with groups taking organized action against this legislation. Support those left behind by “the system” and organize childcare and aged-care groups among yourselves and your community. And most importantly, know your rights as a living human being and, wherever possible, assert them as though your family’s freedom depends on it — because, in reality, it does.